Newly installed President of the Junior Chamber International (JCI), Tobago, Crystal Ottley, right, wears the presidential chain passed from immediate past president Britney Williams, left, at the JCI's annual Appreciation and Installation of Officers and Awards ceremony at the Buccoo Integrated Facility Conference Room on January 5. Offering congratulations, standing at back, from left are Petal Daniel, President JCI West Indies, Brettney Romeo Vice President, JCI West Indies, and Secretary for Infrastructure, Kwesi Des Vignes, also a past president of JCI West Indies. 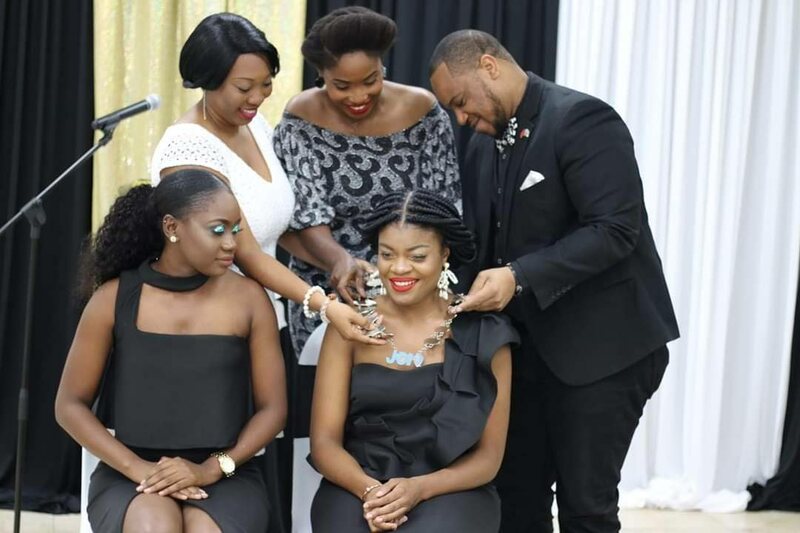 “Let's stop discouraging persons and entities that are actually striving to make a positive change and instead applaud them for the sacrifice of their time and effort,” said newly appointed Junior Chamber International (JCI) President Crystal Ottley. Ottley, speaking at the JCI's annual Appreciation and Installation of Officers and Awards ceremony at the Buccoo Integrated Facility Conference Room on January 5, called on all sectors to work for a better Tobago. “Let us match every problem with a solution. Let’s match constructive criticism with a pat on the back that creates a smile. “Let's effect synergy by holistically combining our efforts and unique abilities for the greater good of the island. When this is done, it will inevitably redound to the positive evolution of Tobago, therein everyone wins,” she said in her inaugural address. JCI is a non-profit organisation of persons 18 to 40 who are engaged and committed to making a difference in their communities. Reply to "New JCI president calls for positivity for a better Tobago"